Is Your Dog Digging Up The Yard? Dog digging stumps numerous owners, and for good reason. Whether it's his new-found escape route under the fence, a means of hiding a favorite bone for later, or simply for the joy of following his nose, dogs have a penchant for digging. As you've probably already heard me say before, the "secret" to solving any dog behavior problem is to catch them in the act. ﻿﻿First of all, give your dog the exercise his or her breed and energy levels require! At the risk of sounding like a broken record on here, I can't emphasize enough how important this is. An under-exercised dog is bored, both physically and mentally. So your number one solution is going to be exercise. Contrary to what you may think, dogs don't dig out of spite. For most, it is simply a matter of burning pent-up energy or out of boredom. It's a type of exercise, so if you don't want your dog to re-create the Grand Canyon, give him appropriate exercise! 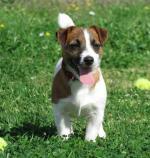 Some breeds were specifically bred to dig - terriers for instance - so this activity comes quite naturally for them. You'll have to give them enough exercise that he won't feel the need to dig (or bark, chew, jump, etc). Always remember - a tired dog is an obedient dog. Without proper exercise, you'll end up with a dog that is full of pent-up energy, and he is going to find other creative ways to release it. Don't blame your dog... you are the one who chose that specific breed or energy level. So even before letting your dog have free reign in the backyard, take him for a good, long walk or jog to burn some excess energy. Be sure to incorporate obedience training in your walks, too, as this will help to exercise his mind (just as important). The best solution for preventing dog digging is exercise! Perhaps you have a high-energy dog, and a simple walk doesn't cut it. Teach him to play fetch! And I mean a controlled game of fetch, where the dog must sit and stay at your side until you command him to fetch, then bring it back, release the ball to you, and sit beside you again. Don't substitute fetch for a good walk, but do it in addition to your walks. 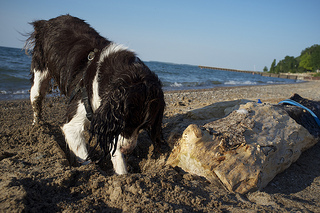 A spaniel enjoying a good dig on the beach. Not into fetch? Try rollerblading together, hiking, running, or going on a bike ride. Or start agility, fly ball, or some other dog sport. Something. Anything. Your dog needs this more than anything else! If you feel like you are having trouble giving your dog the amount of exercise he or she needs, take the next step. Get yourself a doggie backpack, and evenly place a couple of full water bottles (or more, depending on your dog's size) in each side pocket. This will double the amount of exercise that your dog gets! Once you've asked yourself if your dog is getting enough exercise, you can decide whether you need to intensify it or not. Always remember, a dog that is not exercised enough will start to release that bottled-up energy in behaviors like digging, chewing, jumping on people, and nuisance barking. As I mentioned at the beginning, if you are not there to catch your pooch in the act of digging, you can't effectively correct him. That being said, if you do happen to be in the backyard with your dog and he begins to dig, give a sharp, firm "Eh!" only if there is no leash on. If the dog digging tends to happen while you are outside with him, it's a great opportunity for you to correct! Put a collar and leash on (a 20 - 30 foot long line works great), letting it trail along behind your dog. Keep your eyes peeled. When you notice him starting to dig, say nothing, give a fast, firm, pop on the leash (loosen, pop, loosen) to correct. You want the leash tight for only one second. Don't say anything, otherwise you will only teach him not to dig when you are around as he'll associate the correction with you. You want him to think that it's his digging that is causing the correction, not you! 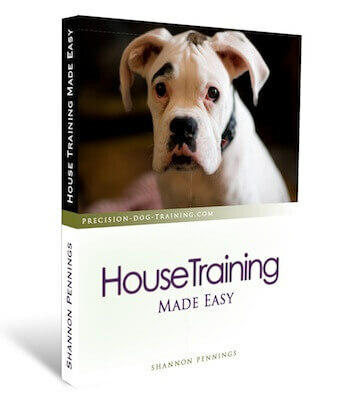 Your other option is to use an electronic remote training collar. Be sure to first learn how to properly fit and use this type of collar. There is always a desensitization period of about a week with the collar before you actually use it. Again, if you put it on the dog and immediately start correcting with it, he will catch on very quickly that the correction is coming the collar... ergo, a collar-trained dog. With this method, the dog doesn't have to be on leash. When you notice the dog digging, press and hold the remote button for 2 seconds, while saying nothing. You guessed it - don't let him associate the correction with the person holding the remote. And of course, praise him when he stops digging. With these solutions, you should be able to easily fire your backyard landscaper and solve dog digging. Always start with increasing the length or intensity of exercise as a first solution, and then go from there. Good luck!